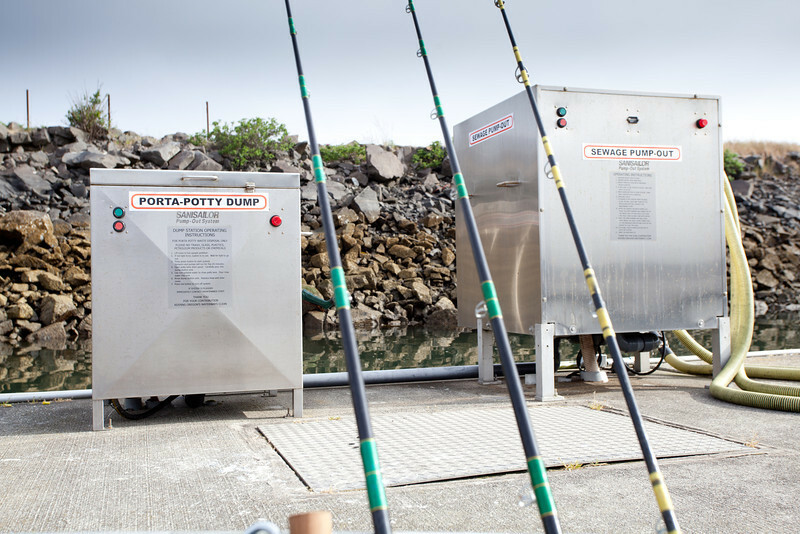 The Oregon State Marine Board (OSMB) has enlisted the help of Oregon Sea Grant to help publicize floating restrooms and waste dumping stations across the state in an effort to protect water quality. Boaters that are on the water for long periods of time accumulate sewage that they inevitably have to dispose of. In some areas, that waste has found its way back into the environment and caused a decline in water quality. The pump and dump stations sit together like a washer and dryer set. These waste systems are helping protect the water quality of lakes and rivers throughout Oregon (Photo by Jeffrey Basinger). Pump stations provide a way for boats with onboard holding tanks to drain their waste into sewers rather than the environment. Dump stations, on the other hand, are for boaters with a porta-potty setup that can be emptied. Together, Kleibacker says the pump and dump machines look like a washer and dryer next to the water. OSMB was awarded money through the Clean Vessel Act to install these pump and dump stations along with floating restrooms for various bodies of water across the state. Following a successful invasive species partnership with Oregon Sea Grant, OSMB recruited the agency to help publicize the underutilized services. Kleibacker and her team found that the most effective communication was the simplest: signage. Through focus groups, interviews, and conversations, they have developed effective signs and informational materials that are now placed around the sites. Sea Grant has shared the results with both OSMB and other states involved in the grant funding. Three of those states have adopted the signage developed here, which Kleibacker says makes her feel like she is making a difference. “We don’t have a lot of programs that are currently reaching out to recreational boaters, and I think that is such a heavy use group along the Oregon coast that it is a really important relationship for Sea Grant to have,” Kleibacker said. Next summer, Kleibacker hopes to hire interns to help maintain that relationship. These students would spend the summer visiting the coastal sites to check on the facilities and talk with boaters and marine operators and staff about the program.